We’ve recently adopted Georgia (formerly known as Velvet). 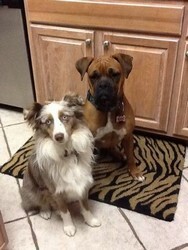 She’s pictured here on the right with our mini Aussie, Fosters. It’s funny, sometimes we look at ourselves and wonder what we ever did before she came along. She is an incredible dog. She’s calm, playful and very obedient!! She’s adapted perfectly to her new home. Georgia and Fosters are ALWAYS wrestling and chasing each other around our backyard…it’s the cutest thing. She knows how to sit, stay and shake and even walks well on a leash. Thank you Austin Boxer Rescue for this blessing! !